Latitude N 51° 2' 44.85" ; Longitude E 2° 50' 34.80"
This is the site of the only remaining original section of WW1 Belgian Army trenches. 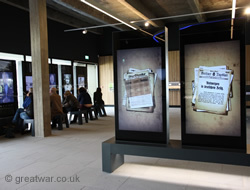 The interpretation centre has been refurbished for the centenary. There are 15 interactive applications, film footage and over 100 objects. Find out about the stories of the men who lived in this part of the front line. Walk over a giant aerial photograph showing the landscape of this area then and now. Latitude N 51° 3' 27.075" ; Longitude E 4° 20' 30.138"
Construction of the fort was started in 1909. It was bombarded for the first time on 1 October 1914 by heavy German artillery under the command of General von Beseler. Von Beseler was under instruction to take Antwerp and from the night of 27/28 September 1914 it was under siege. The fort was bombarded by over 500 shells over the following days. On 9 October the fort was captured by the German Army. The Fort was used during the German occupation in the Second World War as an SS Camp. 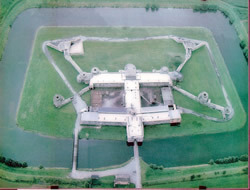 Breendonk Fort was designated as a National Memorial on 19 August 1947. There are exhibitions, educational programmes, and guided visits. Latitude N 51° 1' 54.29" ; Longitude E 2° 51' 8.41"
The tower was built to commemorate the Belgian soldiers who had fought and died on the Yser/IJzer battlefront, a large proportion of whom were Flemish. The tower was built with a crypt where 30 fallen Flemish soldiers were placed. The first IJzer Tower was built in 1928 and inaugurated on 24 August 1930. 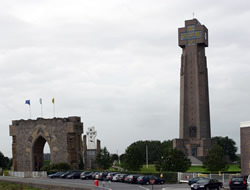 On the night of 15 March 1946 the tower was blown up by people unhappy about the collaboration of some Flemish people during the Nazi occupation. The Paxpoort (Peace Gate) at the site was built using rubble from the first tower. A new tower was started in 1951 and finished in 1965. The tower was refurbished and reopened in 2014. It is 84 metres high with 22 floors housing the Museum of the IJzer. 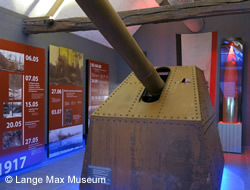 Latitude N 51° 7' 0.663" ; Longitude E 2° 58' 56.657"
A museum opened in 2014 at the remains of the platform of the big German cannon called “Lange Max”. This gun was designed to bombard Dunkirk. Situated behind the German lines north of the Ypres Salient the museum tells the story of life and the military organisation behind the lines for the German troops here. Latitude N 51° 8' 9.29" ; Longitude E 2° 45' 19.59"
Opened in October 2014 the visitor centre is located at the site of the King Albert I Monument and the Ganzepoot (Goose Foot) lock complex. 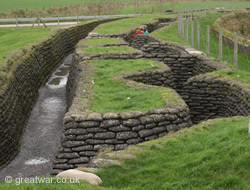 The centre tells the story of the defence by the Belgian Army in the autumn of 1914 and the deliberate flooding of the Yser (Ijzer) river plain to halt the German advance. 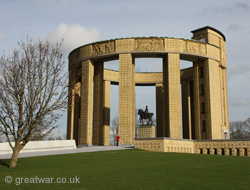 The King Albert I Memorial is located at Nieuwpoort, close to the lock system that was opened in October 1914 to flood the plain and stop the German advance.